The waterfront at Pukerua Bay is a great place for lots of outdoor activities. On a sunny day you might want to park near a beach, take out your swimming things, bucket and spade and while away your time. 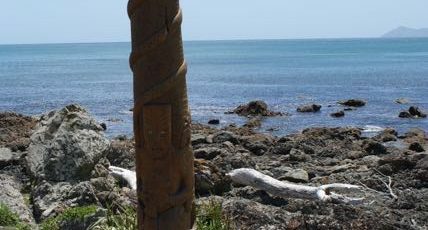 In any season though you can also go for a walk – the coast stretches for miles but within a short distance of the car parking area at the end of Ocean Parade, there’s an interesting Moari Pouwhenua to look at, drift wood to collect and a natural arch cut out of a huge rock. This is also a great place for rock pooling. A great thing to do on a calm day within a couple of hours of high tide (to have the most rock pools exposed). Check the tide times here. If you haven’t taken your kids rock pooling before, we find taking the following helps, although not essential; a net for catching sea life, a bucket for putting it into, shoes that can get wet, togs or a change of clothes and sun block. It’s a good idea to set some rules e.g. about how far the kids can go without you (never, ever leave your kids unattended in rock pools, even if you think it’ll be fine because they’re shallow), that all sea life caught will be returned before you leave, not to pull any sucking creatures off the rocks they’re on (limpets, star fish etc). There are toilets in the car park area. Address: There are small sandy coves all along Ocean Parade, Pukerua Bay with street parking. There’s also a car park at the end of the road which is where the walking track starts. We find anywhere around this car park and beyond is good for rock pooling.